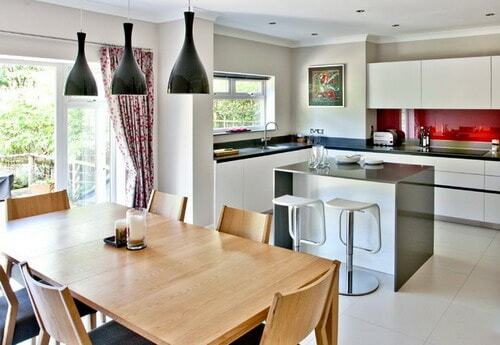 0.0.1 Combined Kitchen and Dining Room present challenging painting opportunities. Combined Kitchen and Dining Room present challenging painting opportunities. A common dilemma when choosing paint colors for combining rooms is whether to paint them the same color or not, and if not, how to transition between them. You could simply ignore the problem and paint whatever colors you like best, but they may prove visually incompatible on the walls. A better way to create harmony between rooms is by emphasizing color choices within the same family, using complementary colors or by making gradual transitions using different shades of the same colors. Use of color visualizers and paint-chip combination suggestions can help you see the possibilities before you paint. Kitchen and dining areas involve food, so choosing appetite-stimulating color schemes is one way to narrow color choice. Warm colors in the yellow/orange/red range promote appetite while blue/green colors suppress it. This doesn’t mean you can’t enjoy a blue or green kitchen and dining room, but you may want to add warmer elements to both rooms, perhaps through light- to medium-toned yellow trim and cabinets paired with light blue walls, for example, tied together further using deeper-toned yellow and blue accents for dishes, linens and seat cushions. Similarly, if you love green, choose yellow-greens such as lime, avocado or olive rather than blue-greens to keep things warm, and pair it with amber-colored woods or similarly toned French grays. 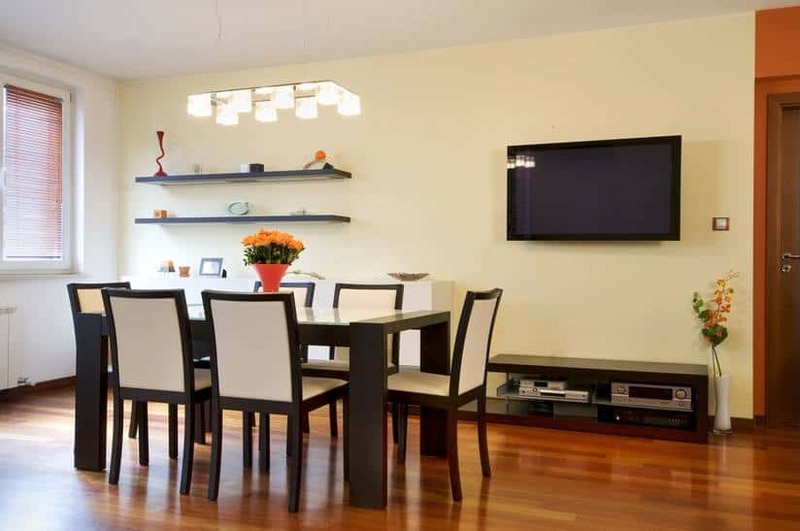 One way to maintain a sense of continuity between combining Kitchen and Dining Room is to use neutral gray or beige as the base color in both, while changing only the furnishing and accent colors. Gray especially transitions well between combining spaces because you can lighten or darken it a shade or two to subtly change each room without appearing to have changed the color at all, and neutral on neutral combos never really go out of style. Unexpected small touches in bright citrus colors or turquoise on pillows, vases and other decorative items will really pop against larger furnishings in black and white in contemporary settings; and for a warmer, more traditional look, hand-rubbed woods on larger furnishings and permanent fixtures such as tables and cabinets is classically elegant. Add variety through textured natural fibers such as burlap, bamboo or hemp. You can harmoniously paint a Kitchen and Dining Room in completely different colors by experimenting with colors close together on the color wheel — called analogous colors. For a warm palette, simply go from yellow to orange, orange to red or red to red-violet — tying the two rooms together with common trim in off-white, warm pale gray or natural wood tones. For extra dimension, add a third close color; for example, transitioning a sunflower-yellow kitchen to a tomato-red dining room by tying them together with a common wall in a muted shade of orange — the color halfway between. A cooler palette might start with mint-green, move to pale blue-violet and finish with sky blue — brought together with bright white or light blue-gray trim. Whether you choose a warm or cool palette, punctuate analogous schemes with accents from across the color wheel, for example, green-checked curtains in a red-painted kitchen or yellow-orange patterned seat cushions in a blue-painted room. 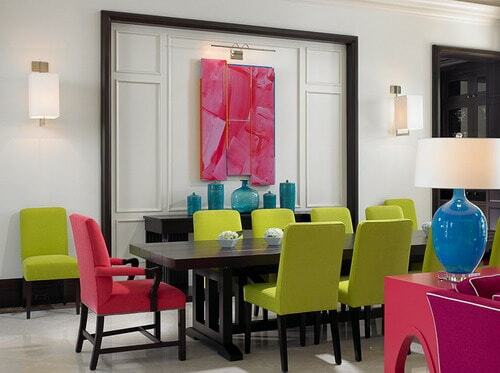 Yet another strategy is to use the same colors in each room, but reverse them for walls and main furnishings. Decide on a two-color scheme, plus accent — such as sage-green and cranberry with white. Apply sage-green as the main paint color on the kitchen walls, picking out small cranberry details for patterns in rugs, curtains and main furnishings. Turn it around in the dining room, with cranberry walls and sage-green accents. Paint ceilings, wood trim and cabinets white in both rooms to visually combine them.